The newest Talkband B5 is a hybrid device which serves not only as a fitness tracker but a Bluetooth headset as well. It showcases a 2.9 cm AMOLED touch screen made up of 2.5D glass which is 2.4 times bigger than its last generation B3 Lite providing the user a more decent and clear display whether in a bright or dull setting. The Talkband B5 turns into a Bluetooth headset when removed from the strap, extremely helpful in making and receiving calls anytime. 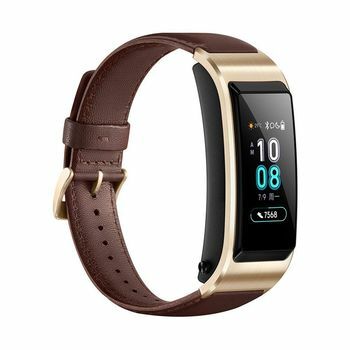 The smart band functions with triple-core audio chipset, HD audio services and dual-mic noise cancelling allowing the user to experience an excellent quality of clear and noise-free voice call. Ensuring a better and healthier lifestyle for the user, the Talkband B5 supports the TruSeenTM, TruRelaxTM and TruSleepTM technologies which help to continuously monitor heart rate trends, stress level and sleep duration and consistency by keeping track of the different sleep stages. The smart band also allows users to keep track of their riding, treadmill running, running and walking activities recording every steps, distance covered and calories reduced allowing to create a running plan and provide performance evaluations. Capturing high quality photos has been made easier for the user with the smart band as a remote camera shutter and easily locate their mobile phones through Bluetooth connections reactivating the phone’s ringtone even when on silent mode.